My kids and I really enjoy watching holiday themed movies and shows. Our Christmas movie collection is somewhat out of control. However what we don't have many of are Halloween movies. 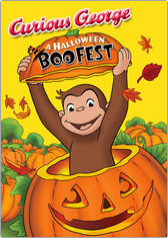 So when they saw the movie Curious George A Halloween Boofest pop up earlier this month, they were excited to watch it. Hang on to your hats and get ready for a spook-tacular good time, with Curious George. Autumn is here, bringing colorful leaves, hay rides, pumpkin patches, and the annual Boo Festival. This ended up being an instant hit with all of us. But no one seemed to enjoy it as much as the four year old. During the week, he goes to pre-school for a few hours after lunch. So multiple mornings, after his big brothers were off to school and it was just the two of us, he would request to watch this. Again. And again. But Curious George is one of the kids' shows that I actually like myself so I couldn't get sick of it. The boys have also recently discovered Disney's "Buddies" movies and they absolutely love them. Those puppies are super cute, though I could do without the constant "Mom, can we get a dog?" questions that pop up after they watch one. Of course there is a Halloween one, Spooky Buddies. 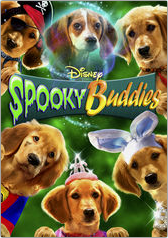 At Halloween, the Buddies, Air Bud's adventure-seeking pups, investigate mysterious happenings at a mansion reportedly haunted by the Halloween Hound. Watching these fun, family-friendly movies has definitely helped to get us in the Halloween spirit. Of course, Netflix has the adults covered for Halloween too and all of you out there who enjoy a good horror film. Personally, I can't watch them as they absolutely terrify me and have me seeing crazy stuff wherever I look. Seriously, I can't even bring myself to post the photos of them here because they freak me out! But for you horror lovers, there is a ton to choose from like Scream or Carrie or, of course, Halloween. FYI: Event Horizon = Scarriest. Movie. Ever. I made the mistake of watching that once. Once. And yes, that is on Netflix too. 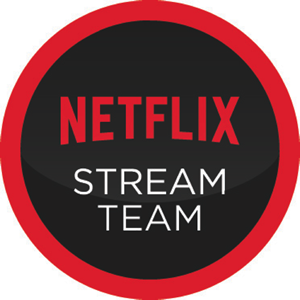 Browse horror films on Netflix! As you and your family prepare for Halloween, what movies do you like to watch?